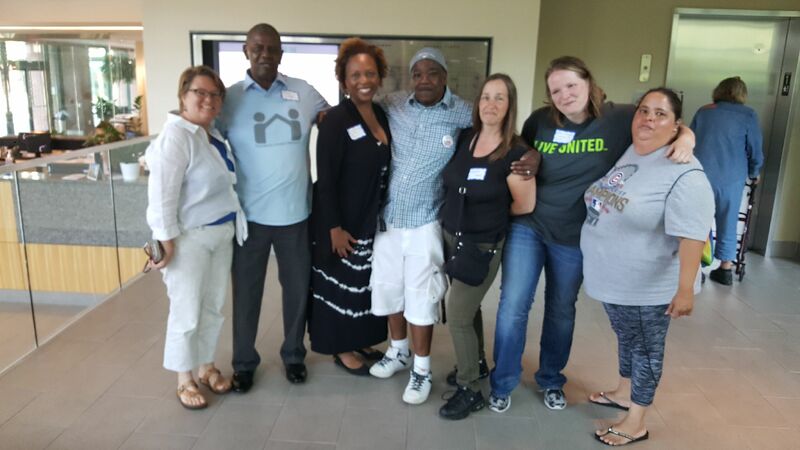 The Resident Action Project is building power to change policy by organizing a statewide network of people who have personal experience with housing instability and homelessness. On Wednesday, July 12, we had the opportunity build that power on a national level by connecting with people who have similar experiences from all across the country. Three members of the Resident Action Project's (RAP) Statewide Steering Committee - Mr. B (Bretrand Harrell), Kristina Sawyckuj, and Lisa Sawyer - joined more than 700 community leaders across the country to demand an end to cuts to federal housing programs and housing inequality. Katy Heins from the Center for Community Change helped to organize the trip. 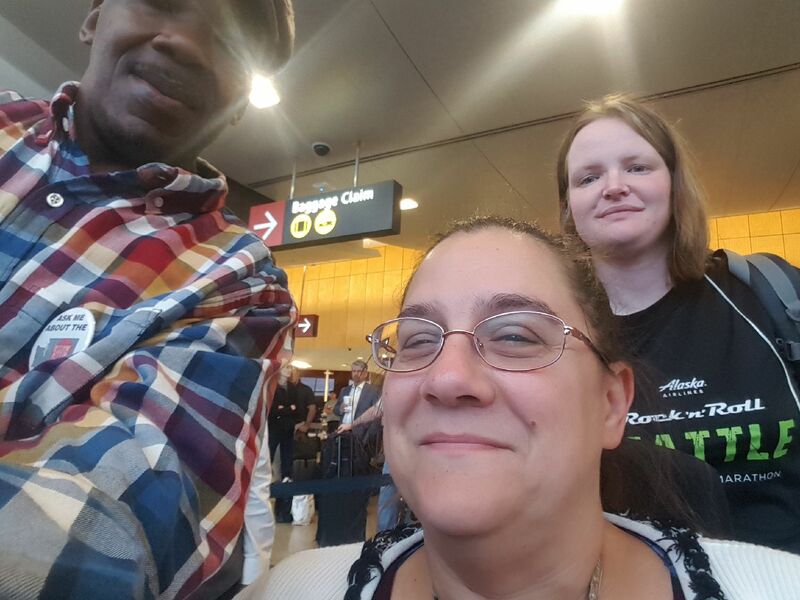 It was exciting for her because members from both RAP and the Residents United Network (RUN - Housing California’s sister project to RAP) came together to begin forming a peer learning network. And, 700+ people who live in affordable homes and have personal experience with homelessness and housing instability came together to elevate housing issues on a national stage. That’s a lot of people power! Mr. B and Kristina started the day by meeting with Senator Maria Cantwell. They discussed the proposed cuts in the Housing and Urban Development Department (HUD), other tax cut proposals, and particular challenges that Veterans face when trying to navigate the voucher system. 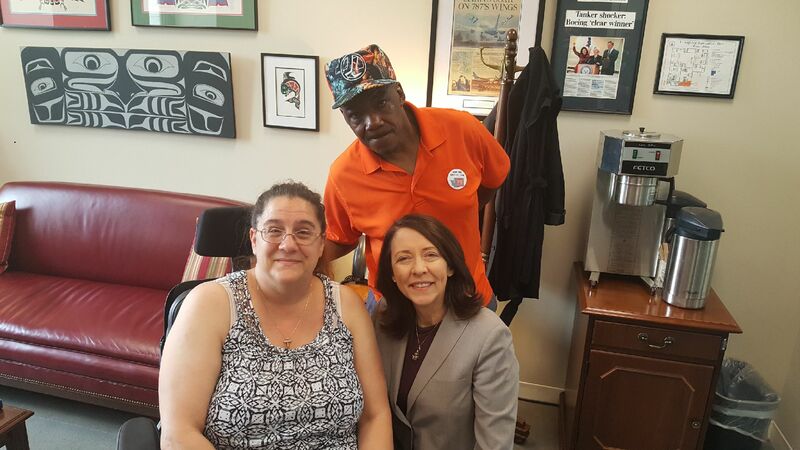 The staff and the Senator spent time listening to their stories, and “Budget cuts hurt us more than help us,” was the message Mr. B left Senator Cantwell with. Following the visit with Senator Cantwell, Mr. B and Kristina met up with Lisa, Katy, and the folks from RUN for a rally that was full of energy. Senator Elizabeth Warren (D-MA) and lawmakers from Chicago and New York revved up the audience after hearing from resident leaders from around the country who shared their personal experiences and possible solutions. Lisa even sold a copy of the Real Change newspaper to Senator Warren! As the excitement and energy rose, the group marched to the HUD office. 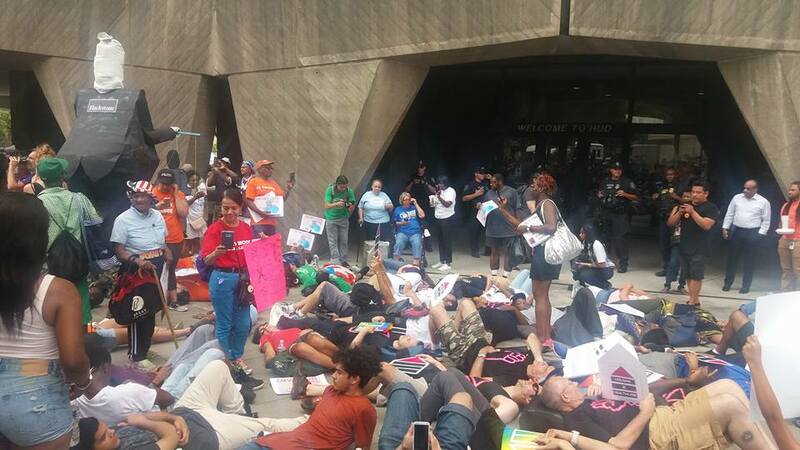 They delivered a letter with demands to HUD Secretary Ben Carson, and followed it with a die-in, which is a demonstration where people lie on the ground in unison. And they weren’t finished! From there, the group marched to Blackstone, which is a private equity firm in Washington D.C. Why Blackstone? At present, the policies of the Federal Housing Finance Agency favor giant private equity lenders like Blackstone and landlords over the average American family. The agreement made this past January for FANNIE MAE to guarantee $1 billion of Blackstone’s Invitation Homes is an appalling example of this practice. [a][b] Furthermore this practice of allows the sale of distressed mortgages to private equity firms puts families at risk and has created a new real estate landscape where private equity firms are now among the nation’s largest owners of single family homes. “The property management companies have made it clear that they value profit more than people and community,” Katy said. The demonstrators delivered a letter to Blackstone as well and showed up in force to let them know that their actions have not gone unnoticed or been disregarded. Katy shared that, “It was the beginning of a long fight that we’re going to be part of. Housing justice in Washington state is even more important, so as we build our power in Washington we can use the power we build to work on the national scene.” Kristina added that more people need to get involved and more work needs to be done to build the momentum we need. In a whirlwind of a trip, our leaders returned to Seattle the following day. Everyone expressed an interest to stay longer and continue working with the other groups that were present, and that gives us hope that we can continue to build relationships and power across the country. For now, we will keep building power here in Washington by engaging with communities locally through our listening tour, statewide with our Statewide Summit for Homes, and nationally with National Week of Action.